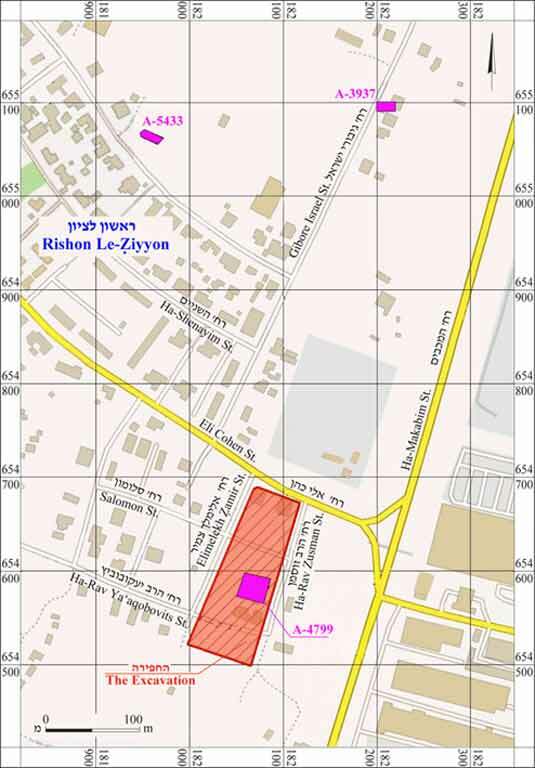 During March 2012, a salvage excavation was conducted in the Nahalat Yehuda neighborhood of Rishon Le-Ziyyon (Ras Abu Dahud site; Permit No. A-6446 [renewal of Permit No. A-6348]; map ref. 181998–2118/654499–689; Fig. 1). 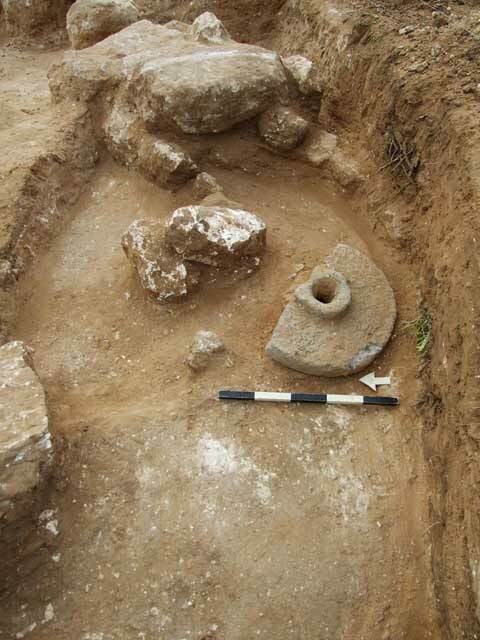 The excavation, undertaken on behalf of the Israel Antiquities Authority and underwritten by the Rishon Le-Ziyyon municipality, was directed by A. Dayan, with the assistance of Y. Arbel and M. Shiff (area supervision), Y. Amrani and E. Bachar (administration), R. Mishayev and M. Kahan (surveying and drafting), A. Dagot (GPS), A. Peretz (field photography), A. Gorzalczany (photography and safety), B. Ajami (safety), F. Volynsky. M. Shiff, D. Golan and Y. Marmelstein (preliminary antiquities inspections), P. Gendelman (ceramics), J. Bukengolts (pottery restoration), M. Shuiskaya (drawing), N. Katsnelson (glass), Y. Kupershmidt (metallurgical laboratory), A. Lester (jewelry), and C. Amit (studio photography). The site is located in a region of kurkar hills where numerous arcosolia tombs had been hewn and many were destroyed by quarrying. Remains of a large building were exposed at the site in the early 1960s. The building contained, among other finds, pottery fragments that dated to the end of the Second Temple period, several bronze coins from the reign of Nero, pieces of a mosaic floor and many fresco fragments adorned with geometric decorations in five colors, probably collapse from the building’s second story. The excavator, J. Kaplan, suggested that the building was an estate house, which was subsequently destroyed during Vespasian’s conquest of Yafo in the Great Revolt (HA 4:15 [Hebrew]). A rock-hewn burial cave containing ten loculi was exposed near the building in the early 1970s. The cave had probably been plundered in the past and the few potsherds discovered inside it dated to the first century CE (HA 40:13 [Hebrew]). Another rock-hewn burial cave was excavated at the site in 1998; it included eight loculi and a repository chamber containing ossuaries. The cave, damaged by a later quarry, was dated to the Early Roman period based on its plan (License Nos. B-32/1998, B-162/1998; it is mentioned in Zelinger. 2009. P. 49). Settlement remains were exposed at the site in 2003 and included walls, pottery and coins dating to the years between the Great Revolt and the Bar Kokhba uprising (HA-ESI 121; Fig. 1: Permit No. A-3937). 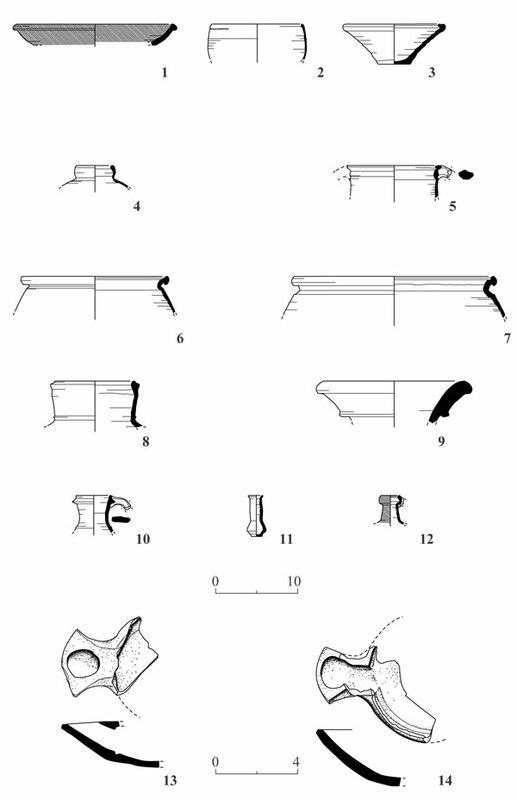 Refuse pits that contained fragments of pottery vessels dating to the Byzantine and Ottoman periods were exposed at the site in 2006 (HA-ESI 121; Fig. 1: Permit No. A-4799). 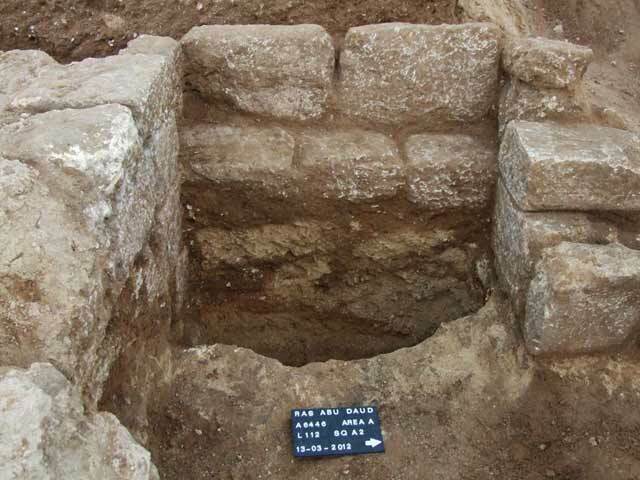 More refuse pits, which contained potsherds and coins dating to the Byzantine period, and a coin from the Mamluk period, were exposed at the site in 2008 (HA-ESI 122; Fig. 1: Permit No. A-5433). 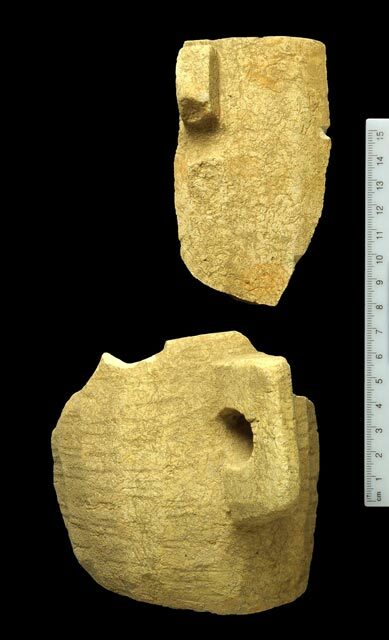 During antiquities inspections at the site, a fragment of a stone measuring cup, which is characteristic of Jewish populations in the Second Temple period, was discovered (HA-ESI 122). The finds at the site seem to indicate that a Jewish settlement and cemetery used by its residents were located there. The increased construction of recent years in Nahalat Yehuda follows to a great extent the natural topography of the site, which consists of low kurkar hills separated by clefts. Kurkar cliffs remained in the area of the site. Three excavation areas (A–C; Figs. 2, 3) were opened. 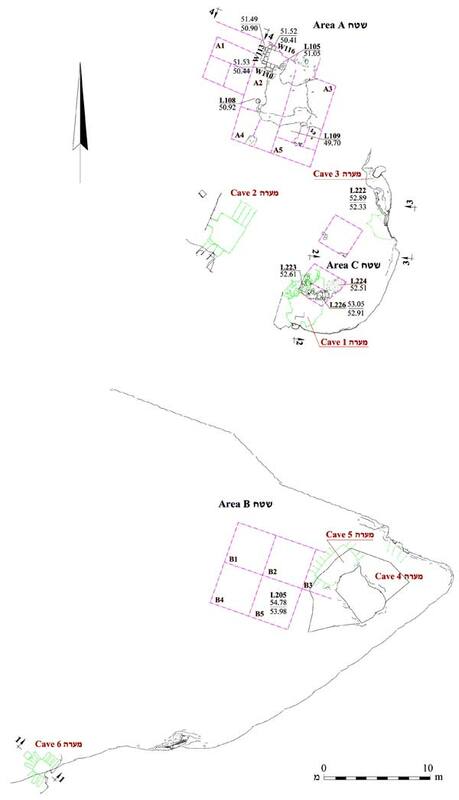 Five squares (1–5; each 4×4 m) were opened in Area A and a trial trench was dug north of Sq A1 (Fig. 3: Section 4–4). Rock-cutting remains and ceramic finds dating to the first and early second centuries CE (Stratum II) were uncovered, as well as remains of a building, rock-cuttings and ceramic finds from the eighth century CE (Stratum I). Five squares (1–5) were excavated in Area B, which was severely damaged, and meager remains of a tomb and two caves (4, 5) were exposed. 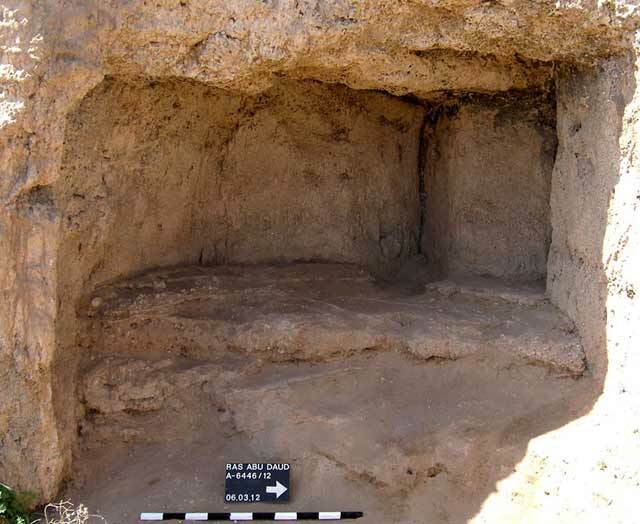 Architectural remains and three hewn caves (1–3) were discovered in Area C; one of the caves was used as a cistern and another served for burial. 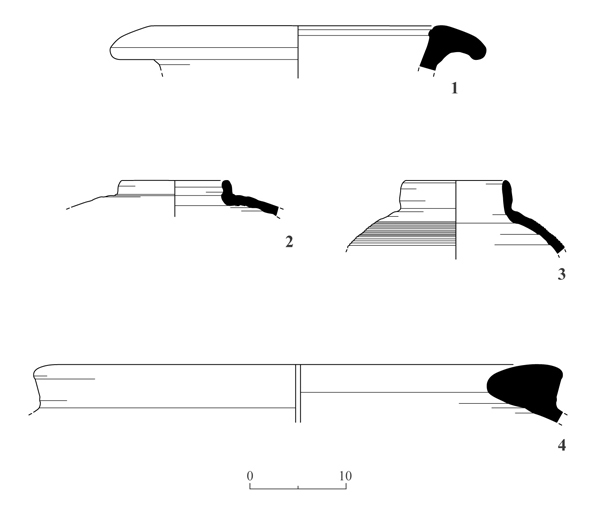 Another hewn burial cave was cleaned and documented southwest of Area B (6; Fig. 4); this might be the burial cave excavated close to the large building in the early 1970s (see above). Stratum II. Most of the finds ascribed to this layer were discovered in the excavation of a trial trench (Fig. 3: Section 4–4; depth 1.8 m). Three superposed levels were discovered in the trench. A level of dark friable compacted soil (L107) was in the upper part of the trench probably related to the later activity at the site (Stratum I). A layer of crushed kurkar, tamped soil, stones and possibly plaster (thickness c. 0.15 m) was below the soil level. The bottom level, ascribed to Stratum II, was soil overlying the bedrock (L115). Numerous fragments of pottery vessels dating to the first and early second centuries CE were mixed in the soil and included a CTS bowl (Fig. 5:1), bowls (Fig. 5:2, 3), a cup (Fig. 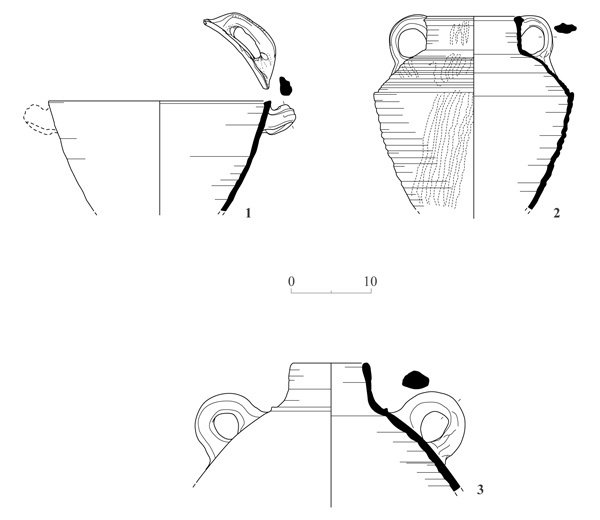 5:4), cooking vessels (Fig. 5:5–7), a baggy-shaped jar (Fig. 5:8), an amphora (Fig. 5:9), a jug (Fig. 5:10), a perfume juglet (Fig. 5:11), a spindle bottle (Fig. 5:12), and knife-pared Herodian lamps (Fig. 5:13, 14). Several fragments of stone vessels were discovered in the lower level of the trial trench, including measuring cups (Fig. 6) and probably a large kalal and chalices (Fig. 7). A short section of a rock-cutting, which might be the remains of a burial cave’s hewn ceiling, was revealed in the bedrock at the bottom of the trial trench. Stratum I. Remains of a building founded on the bedrock were exposed in Sq 2 (Fig. 8). Three walls (W110, W113, W116), built of partially dressed stones, were preserved. A square stone pillar (c. 0.8×0.8 m) was built next to W110. The craftsmanship of the dressed stone in W116 was much better than that of the stones in the rest of the walls. This may be because the entrance was set in this wall as indicated by a dressed stone incorporated in the wall on its short, narrow side, which probably served as a doorjamb. The stones in W113 were set on their long narrow side. A stone bench was built next to the lower inside of this wall. The color of the soil changed c. 0.2 m above the bedrock. This might indicate the existence of a tamped earth floor at this level, which was not preserved. Pottery fragments and a few glass vessels, mostly dating from the second half of the seventh until the first half of the eighth centuries CE, were discovered in building. Clusters of hamra, sand and kurkar mixed with many potsherds were exposed in all the squares. Bedrock was exposed at a maximum depth of 0.15 m below the surface in Squares 2–5. A thick layer of soil extending from just below the surface down to the bedrock was revealed in Sq 1. The bedrock in all the squares bore signs of rock-cuttings that are characteristic of quarries for building stones. Presumably, no quarry existed at the same time next to burial caves, and it seems that the quarry postdated the caves and should be ascribed to Stratum I. The ceramic finds from the soil clusters date to the Umayyad period and include some cooking vessels (Fig. 9:1, 2) and mainly jars (Fig. 9:3). No potsherds dating to the Abbasid period were discovered among these finds, nor were there any sherds that were unequivocally characteristic of the Byzantine period. No architectural remains or floors that can be associated with the ceramic finds were discovered. A jar without a base embedded in soil was discovered in Sq 2; however, no floor, walls or installations that can be connected to it (L108; Fig. 10) were identified. Three complete jars were discovered in Sq 5 (L109; Figs. 11, 12); one jar was imported from Egypt (Fig. 13:1) and the other two are locally produced baggy-shaped jars (Fig. 13:2, 3) that were discovered inside a soil accumulation beneath a bedrock ceiling that probably protected the jars from breaking. Based on the ceramic artifacts, their concentration and preservation, as well as the absence of architecture relating to these find, it seems that the soil accumulations belonged to refuse pits. Non-articulated bones were found in Sq 2; these probably belonged to an adult and an infant (L105). This burial cannot be dated and it appears that several burials took place in the area in a later period. Squares 1, 2 and 4 were excavated down to the kurkar bedrock level and no architectural finds were discovered. Four stones (L205) were exposed in Sq 5 and beneath them were several human bones, not articulated. Burial Cave 4 was exposed in the excavation of Sq 3. 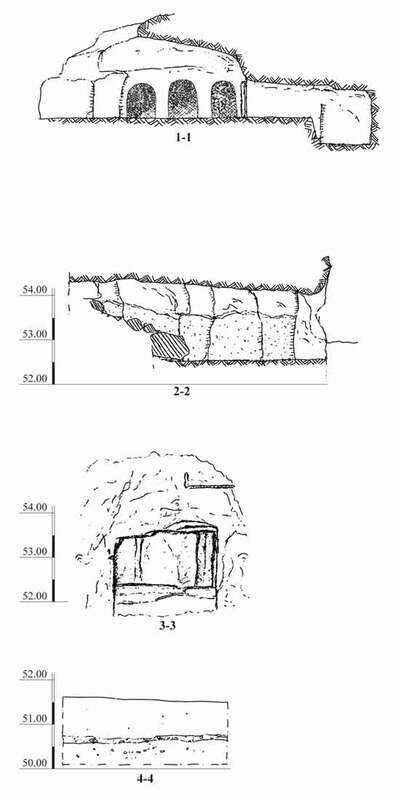 This is a burial cave whose ceiling collapsed; its two loculi were discerned in the northern section of the cave. The excavation in the cave was suspended because of safety considerations and due to demands of the Ministry of Religious Affairs. Upon completion of the manual excavation in Squares 2 and 5, a backhoe was employed for the purpose of determining the boundaries of Cave 4. 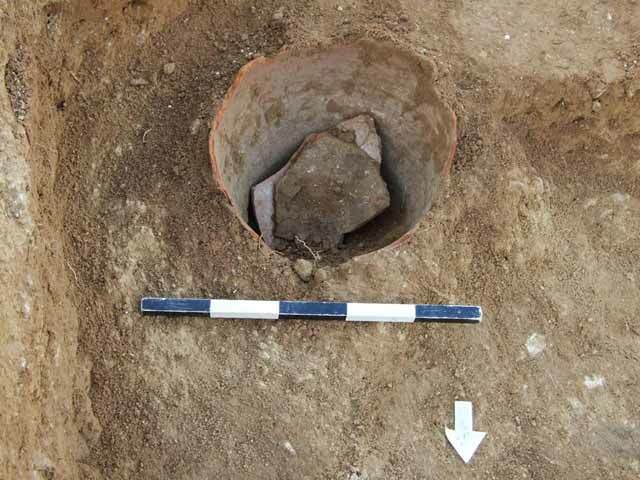 In this excavation, a Gezer-type lamp that dated to the third–fourth centuries CE was discovered (Fig. 14). A meager amount of pottery from the Late Roman and Byzantine periods was discovered in the area, including a mortarium (second–fourth centuries CE; Fig. 15:1), a jar (second–fourth centuries CE; Fig. 15:2), a baggy-shaped jar (sixth–seventh centuries CE; Fig. 15:3) and a pithos (fifth–seventh centuries CE; Fig. 15:4). These finds indicate that activity at the site took place during these periods. 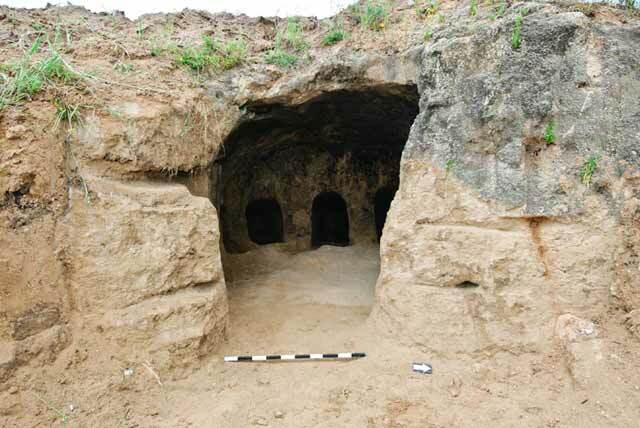 The entrance to Burial Cave 5 was discovered while excavating Cave 4. The entrance was opened but the excavation was suspended. A plastered installation (L226; Fig. 16), built of large ashlars, was exposed in the southern part of the area. Two sections of a plaster floor (L223, L224) were discovered close to the installation. 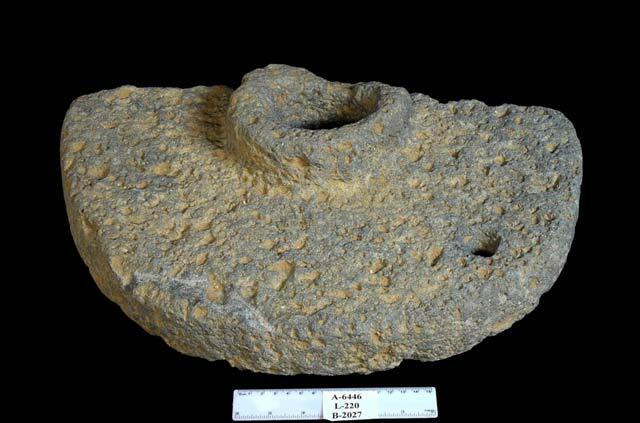 A broken basalt millstone was found adjacent to one of the floor sections (Fig. 17). Installation 226 probably functioned as a water channel that led to the opening of a cistern, exposed beneath the installation (Cave 1, below). After the installation was no longer in use, it served, in secondary use, for burials in a later period. It is also possible that the installation was originally built as a Muslim cist tomb. Two skeletons, one on top of the other, and a metal earring (Fig. 18) were discovered inside the tomb. The bones were turned over to a representative of the Ministry of Religious Affairs, without any possibility of further analysis. 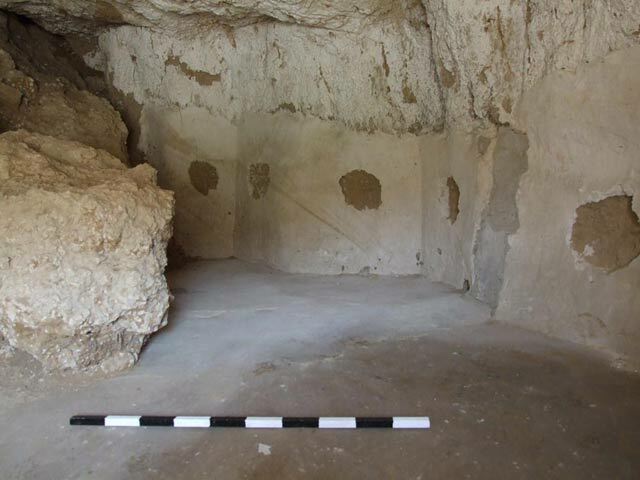 Cave 1, rock-hewn and plastered, was exposed below Installation 226 (Fig. 19); it seems to have been used initially as a cistern. In a later phase, an opening was breached in the side of the cave, probably to utilize it for some other secondary use. Burial Cave 2 was exposed in the western part of the area. This was a rock-hewn cave that contained several loculi. A dressed stone that blocked the opening of the cave was discovered in situ. The cave had previously been broken into and old graffiti was discerned on its walls. A poured concrete floor (L222) was discovered in a probe in the north of the area. It adjoined a wall that was built of modern cinderblocks. It seems that these are remains of a dwelling dating to the early 1950s. In addition, meager remains of a rock-hewn cave (3) were discovered, including part of a loculus containing soil fill and bones; the loculus was not excavated. Remains of rock-cuttings (Fig. 20; Fig. 3: Section 2–2) that might be a burial cave were discovered nearby, to the south. Three phases of activity were revealed in the excavation. Remains of several burial caves are ascribed to the first phase. Based on their plan and the artifacts they contained, they seem to date to the late Second Temple period (first century BCE–first century CE). During this phase, it is possible that the area was part of a necropolis of a Jewish settlement that existed nearby and has not yet been discovered. Remains of a magnificent building, which was apparently destroyed during the Great Revolt, were discovered in a previous excavation at the site and a cemetery was located on the kurkar ridge nearby (Zelinger 2009:49). The refuse pits were attributed to the middle phase and are dated to the Umayyad period. During this phase, debris collected in the area. 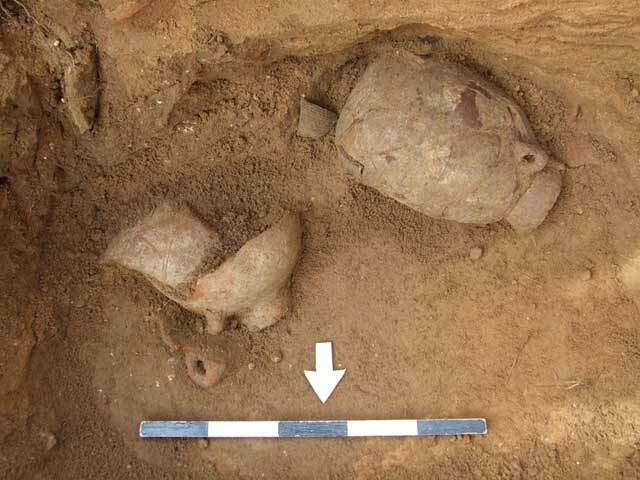 It was composed of soil accumulations mixed with large amounts of ceramic finds, consisting of mostly storage jars that originated in the settlement. 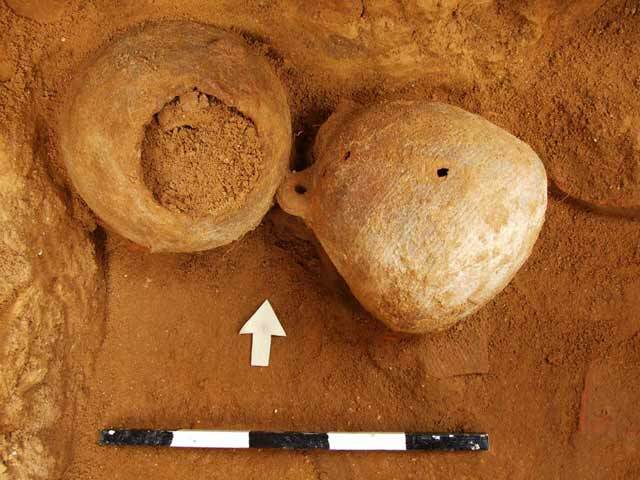 Another more likely possibility and one that is in keeping with the nature of the finds is that the jars came from storehouses or some sort of industrial activity. The site was used for burial in the late phase. During both phases of activity, the Early Roman and the Umayyad periods, the excavation area was located outside the boundaries of the settlement that probably existed nearby. Y. Zelinger. 2009. The Rural Settlements in the Shephelah of Lod [Lydda] during the Second Temple Period. Ph.D. dissertation (Hebrew). Bar-Ilan University. 4. Burial Cave 6, looking west. 5. Area A, Stratum II, pottery from the Early Roman period. 6. Area A, Stratum II, stone measuring cups. 7. Area A, Stratum II, stone vessels. 8. Area A, Stratum I, building remains, looking west. 9. Area A, Stratum I, pottery from the Umayyad period. 10. Area A, Stratum I, a jar without a base, embedded in the soil. 11. Area A, Stratum I, a complete Egyptian baggy-shaped jar in situ, looking south. 12. Area A, Stratum I, two complete baggy-shaped jars in situ, looking north. 13. Area A, Stratum I, baggy-shaped jars. 14. 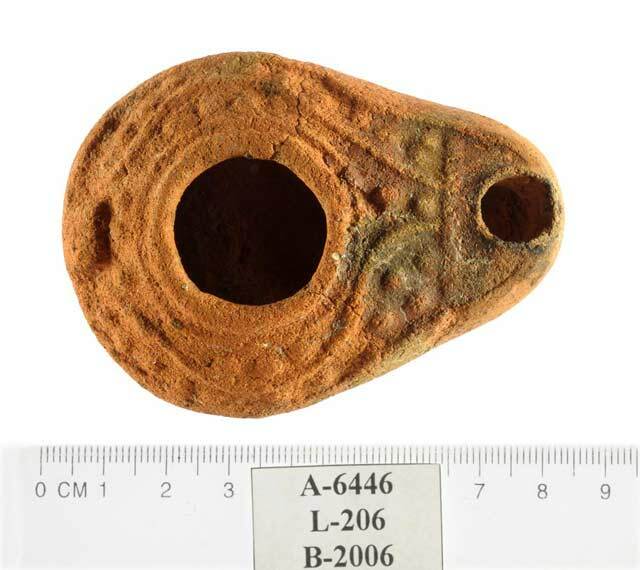 Area B, an oil lamp. 15. Pottery from the Late Roman and Byzantine periods. 16. Installation 226, looking west. 18. 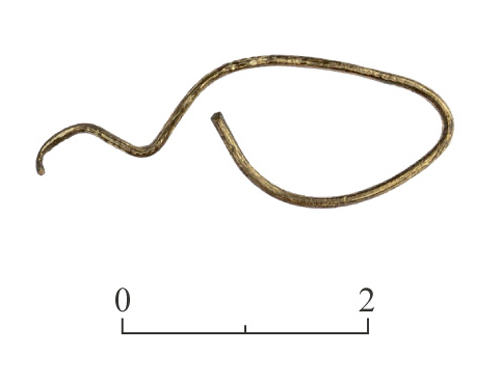 An earring from a tomb. 19. Cave 1, looking north. 20. Rock-cuttings in the bedrock, looking west.